Liquid Ginseng with Royal Jelly combines two popular supplements into one dynamic formula. Ginseng is one of the oldest and most highly regarded herbs. 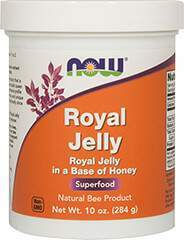 Royal Jelly is a highly complex substance secreted from the glands of nurse bees and fed to larva of those destined to be queens. Both give you herbal goodness fit for royalty.